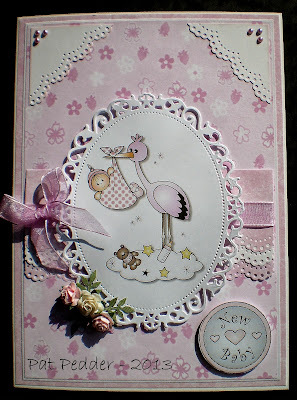 This is gorgeous Pat, I love the cute image, pretty papers and fabulous layout too. Pat your card is simply adorable! Great choice of image! Adorable and so gorgeous Pat. What a sweet baby card Pat - just perfect for a sweet baby girl. I know you card will be treasured. Aww what a sweet image Pat - I love the Pink Gem ones for new baby - they are very cute! The papers and embellies are very delicate and pretty… it's a beautiful design!! So cute ! The image is just adorable ! sooo pretty. Love the frame die you've used. Wonderful combination of papers and the pretty bow is such a perfect fit.